Cats are evil, I have always known this – don’t ask how but I just do1, and now science is proving me right. Sadly dogs, which everyone knows are humans best friend and the most perfect animal on Earth, are also to blame for the latest environmental impact described in a cool new publication by Gregory Okin2 at UCLA. 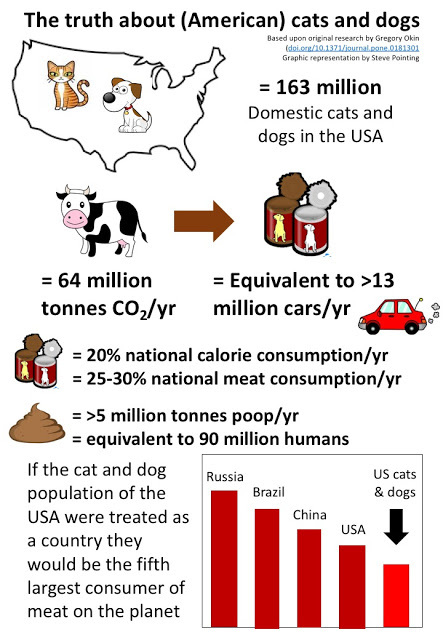 Okin reasoned that the 163 million dogs and cats in the USA consume a lot of animal-derived products and so their impact from this consumption and its production has implications for greenhouse gas emissions, feces production and national dietary energy budgets. I have created this visual summary based upon Okin’s data, and am very proud that my childish side managed to keep the ‘poop’ images to a minimum. 1 I kind of do know why, I came to Singapore from New Zealand where domestic cats murder millions of native birds every year, so my (some may say) irrational hatred of cats seems quite justified in my thoroughly unbiased and fair-minded view! 2Gregory Okin is well known for his excellent research on desert dust and so as a fellow desert researcher this was a really refreshing read, well except for the poopy bits! 3Before any cat lovers send me hate mail please know that this was said purely in jest and I know it is neither desirable or practical to get rid of all cats. We should of course be far more considerate to our cat population – and perhaps cull only half of them (also a joke).